Home » Economy » U.S. Economy » Will Black Friday Eventually Come to an End? On Thursday, masses will line up outside of Best Buy, Target and malls across America to snag the best deals of the season for them and their loved ones. It’s a trend that’s come to be known as Black Friday, even though the frenzy starts on the evening of the Thanksgiving holiday. One thing I noticed this year, though, was that many Black Friday sales started as soon as the ads were released at the beginning of November. The “doorbusters” are what everyone is lined up for. If you’re not in the need of a new flat-screen TV, there isn’t much worth waiting for. Still, Black Friday is one of the world’s largest shopping days, where the average consumer spends over $1,000. 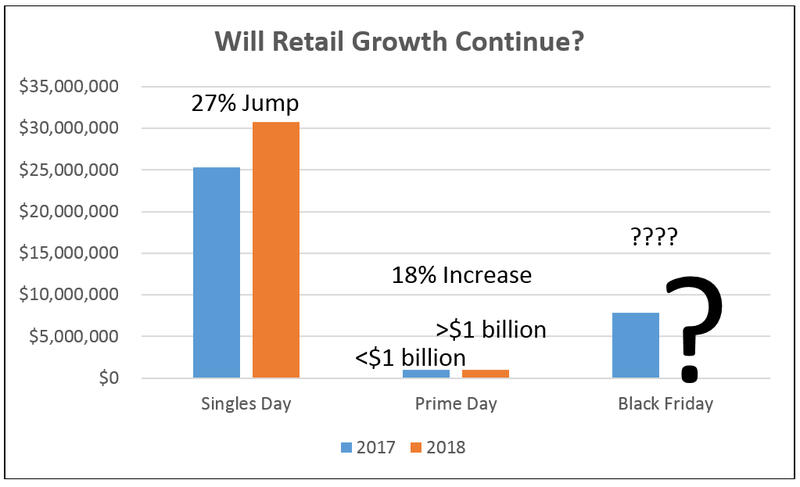 It’s compared to Alibaba’s Singles’ Day, the Chinese equivalent of Black Friday and Amazon’s big shopping event, Prime Day. Though each are not on the same level based on sales, they are all economic benchmarks for the consumer economy. Has Black Friday Lost Consumer Appeal? Singles’ Day is on November 11 every year (11/11), while Amazon’s Prime Day occurs in July each year. Black Friday is always the Friday after Thanksgiving, and shopping habits on that day have helped drive year-end growth for the stock market. It’s a bellwether for the consumer economy. But with sales beginning sooner, and fewer willing to wait in long lines for a discount, Black Friday may not be as important as it once was. Holiday spending could still see a respectable increase. But sales from the most-watched day could end up disappointing investors. While everyone is watching for headline numbers to come out of Black Friday sales, stay focused on the overall shopping environment during the holiday season. After all, customers who are less willing to wait in line for discounts are likely customers with more cash in their pockets. A strong holiday season with a lackluster Black Friday could be an extremely bullish sign for the stock market.